This is the tenth time The Mountain Company has organised the Complete Lunana Snowman trek in Bhutan. Our Snowman 2018 group successfully made the full traverse from Paro through Lunana out to Bumthang. The Mountain Company has 100% track record of organising this challenging 28 day trek through the remote Bhutanese Himalaya. This year we had eleven trekkers signed up for Lunana Snowman and like in previous years this group was an international mix with people coming from UK, New Zealand, Australia, Canada, Ireland, Germany and the Netherlands. For 2018 Snowman our international leader, Almas Khan, worked with our regular Bhutanese guides Tashi and Tsering Dorje. Nawang worked as our third guide and he has learnt a lot from working with our regular crew so we hope to work with him again on Snowman next year. Many thanks to Almas, Tsering Dorje, Tashi, Nawang, Tandim Sonam and rest of the crew for all of their hard work organising and leading another successful Snowman trek. We have now launched the dates and prices for Lunana Snowman in April 2020 on TMC website and this departure is now already guaranteed to run. Please get in touch with us soon if you like to join our Snowman Spring 2020 group. 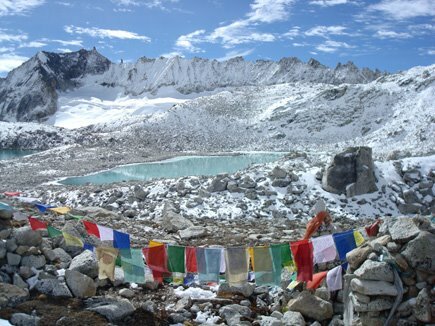 Our 2018 Lunana Snowman trek is now guaranteed to run! The Mountain Company's Lunana Snowman trek in Bhutan during September/ October 2018 to be led by Almas Khan is now guaranteed to run. 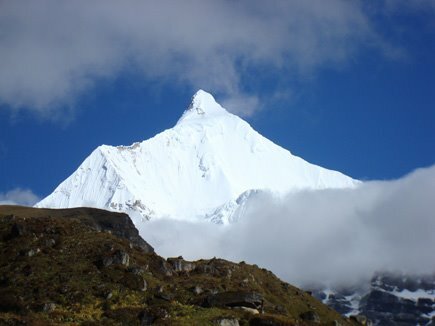 The Mountain Company has a long track record of organising treks in Bhutan, our groups have successfully completed the Lunana Snowman trek on nine previous occasions. Please get in contact with us soon if you would like to join our Lunana Snowman group in 2018. This is the ninth time The Mountain Company has organised the Complete Lunana Snowman trek in Bhutan starting in Paro and finishing in Bumthang. Our Snowman 2017 went well and this group successfully made the full traverse through Lunana out to Bumthang. The Mountain Company has 100% track record of organising this challenging 28 day trek through the remote Bhutanese Himalaya. Overall the weather and conditions were favourable compared to previous years although this group had some rain & cloud crossing Karchung La into Lunana however they got lucky with stable & sunny weather on the exit passes over Gophu La and Saga La. Our Snowman 2017 group made good progress and did not lose any days due to bad weather or other delays along the way. 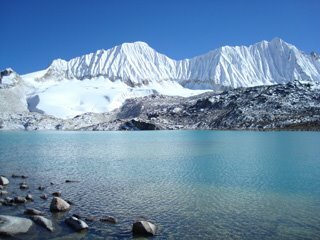 This year the leader Almas Khan decided to have two nights at Thanza to allow the group and crew to rest as the weather forecast was showing stable weather for a week allowing adequate time to cross Gophu La and Saga La. Many thanks to Almas, Tsering Dorje, Tashi, Tsering, Sonam and rest of the crew for all of their hard work with organising and leading another successful Snowman trek. Thanks also to Kinley and Dawa in the office in Thimphu who have provided an excellent service with their logistics and planning for this long and remote trek. We have now launched the dates and prices for Lunana Snowman 2018 on TMC website so please get in touch soon if you would like to join this group. We have already received strong interest and this group is likely to fill fast as Snowman 2017 was fully booked with fourteen trekkers. The Mountain Company's Lunana Snowman trek in Bhutan during September/ October 2017 led by Almas Khan is now guaranteed to run. We are now starting to take bookings for our Lunana Snowman trek in 2018 so please get in touch if you are interested in joining this group. The Mountain Company's Lunana Snowman trek in Bhutan during September/ October 2017 led by Almas Khan is now nearly guaranteed to run and there is currently availability. Please get in contact with us soon if you would like to join our Lunana Snowman group in 2017. This is the eighth time The Mountain Company has organised the Complete Lunana Snowman trek in Bhutan starting in Paro and finishing in Bumthang. After another successful Snowman in September/ October 2016, The Mountain Company has 100% track record of organising this challenging and long trek through the remote Bhutanese Himalaya. This year we had ten trekkers signed up for the full Snowman and like in previous years this group was an international mix with people coming from Australia, Finland, Netherlands, Germany, Denmark and UK. Our 2016 Snowman group was led by our regular guide, Almas Khan. Almas has now completed Snowman trek eight times including both Bumthang and Nikka Chu exit trails from Lunana. For our 2016 Snowman we had several new crew members including the cook, Sonam, and his kitchen helpers. We have made some changes to our logistics and organisation for Snowman 2016 as the food on Snowman 2015 was disappointing. We have worked with our partners in Bhutan and Almas’s wife, Jayne Khan, flew out to Bhutan in August to help train Sonam and work on the supplies and provisioning for this long trek. This effort has paid off and we received positive feedback on the food from the group. We were happy to have our regular Bhutanese guide, Tashi, on board and Tsering Dorje joined our group again this year. Tsering guided on two of our previous Snowman treks however had a break for a few years as he was busy in Autumn season as a cultural tour guide. Our third Bhutanese guide was called Tsering too. 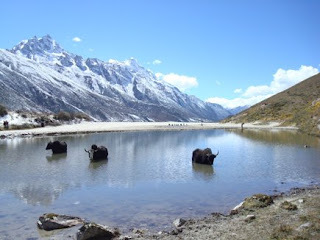 The big news in Himalaya this Autumn season was the late monsoon as this year finished raining much later than usual by mid-October. Normally the heavy rains are decreasing by end of September however the timing and intensity of monsoon varies year to year. Our Snowman 2016 was unlucky as when monsoon was winding down a low pressure system came off Bay of Bengal bringing in more heavy rain on October 12th and 13th. Throughout the course of Snowman trek we received bespoke weather forecasts from Michael Fagin at everestweather.com and this information is sent through to Almas on his satellite phone. Having professional weather forecasts is essential for safety in crossing high passes and for decision making in the field. Michael sent us advanced warning of this low pressure system and tracked its path so we could provide Almas with information a few days before its arrival to Bhutan. 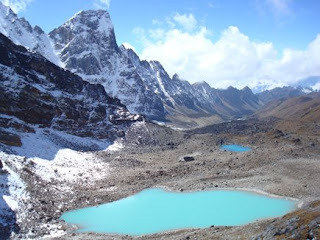 Normally by the time group arrives to Chomolhari BC the weather improves however it is important to start this trek in September as a week or two later precipitation will fall as snow on the exit passes of Gophu La and Saga La. As mentioned in previous Snowman trip reports the number of days on Snowman is longer than the typical weather window available. The compromise is to start earlier in Autumn season when there is still a chance of precipitation however it means it is less likely for the exit passes of Lunana to be blocked by snow as the snowline is higher at this time of year. This strategy worked for Snowman 2016 as after the low pressure system discussed above passed through the snow was not too deep on the high passes and melted off quite fast. Therefore we had no issues with our pack animals and group crossing these passes. For this year’s Snowman we modified our itinerary from Snowman 2015 as the group spent two nights in the less visited Haa valley before starting the trek. After the group's arrival to Paro they had one night at Olathang hotel and then next day the group walked up Tiger's Nest and then in afternoon drive over Chele La (3,780m) to Haa Valley. After two nights at Haa valley they drove back over Chele La and then drive on through Paro to Shana for the first night's camp of the trek. We believe our modified 2016 Snowman trek should add in terms of interest and also increase our groups chances of safely completing the Snowman trek. Our Snowman 2016 group made good progress and did not lose any days due to bad weather or other delays along the way. As usual Almas decided to have only one night at Thanza and to keep moving in case a spare buffer day was required later on. In the end they arrived to the hot springs at Dur Tsachu one day early like previous year so they had two nights to relax in the hot tubs. “The Mountain Company organised an excellent Snowman trek in Bhutan. The pre-trek information and advice was very helpful and the trek was expertly led in country by Almas Khan, a very experienced trek leader who has now completed numerous Snowman treks. The 27 day Snowman Trek was a tough challenge, both physically and mentally. The terrain was remote and often spectacular. Sandwiched between the monsoon and the start of the winter snows it pays to be well equipped for all weather. The many ascents are not technical but are often long. The steep descents often require a lot of concentration. Paths vary from smooth and dry to mud and rocks. Many thanks to Almas, Tsering Dorje, Tashi, Tsering, Sonam and rest of the crew for all of their hard work, great job again! Thanks to Jayne Khan for all of her help with training the cooks and her work on provisioning. Thanks also to Kinley and Dawa in the office in Thimphu who worked hard to improve their level of service and have responded well to our feedback from Snowman 2015. We have now launched the dates and prices for Lunana Snowman 2017 on TMC website so please get in touch soon if you would like to join this group. Almas Khan has confirmed his leadership for next year’s Snowman and we have already received confirmation from five people so I am confident our Snowman 2017 will be guaranteed soon. As soon as Druk Air starts to taking bookings for flights for dates of Snowman 2017 we will ask people to pay deposits if they like to go ahead to sign up. If you have already done Lunana Snowman then you may be interested to hear Almas will also be heading back to Bhutan in April 2017 to lead our Rodung La with Sakten and Merak. This trek is an extension of the Lunana Snowman trek by starting in Bumthang and continuing east to Trashi Yangtse along The Great Himalaya Trail ("GHT"). The Mountain Company's Lunana Snowman trek in Bhutan during September/ October 2016 led by Almas Khan is now guaranteed to run and there is currently availability. Please get in contact with us soon if you would like to join our Lunana Snowman group in 2015.